Do you enjoy fine wines and have an interest to gain a deeper understanding and appreciation for the ‘Fruit of the Gods’? You may have already been introduced to one of South San Francisco’s finest establishments that have taken up residency in our historic brick building, 415 Grand Avenue, across from City Hall. 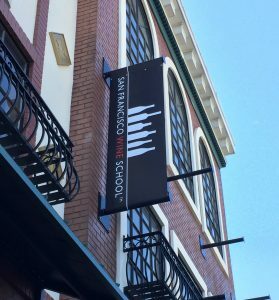 San Francisco Wine School offers a menu of classes and seminars for the novice through formal education for those seeking to become Sommeliers. This event offers ‘heavenly sips and gourmet bites from around the world as you mingle with panelists and instructors, enjoy sabering demonstrations, hilarious service olympics and explore the many unique auction items all benefiting the new Glancy Wine Education Fund!’. With the value of $125pp. Everything South City thanks SF Wine School for making this opportunity available to two of our lucky followers. In addition, South San Francisco neighbors can enjoy a discount when purchasing tickets online by using code SSFNeighbors at check out. To view the amazing auction prizes CLICK HERE which include Meadowood Daytime Excursion with VIP Access to Private Wineries and Lunch for 8, Yachting on the Bay & Exclusive Wine Tasting with Wendy Shoemaker, and the ‘Ultimate Cabernet Experience’ for 4 Guests at Hall Wines in Saint Helena to name just a few. This fundraising event supports the Glancy Wine Education Fund, as noted below. In cooperation with Wine Spectator and the Golden Gate Restaurant Association, please join us Saturday, November 5th for our spectacular Anniversary Celebration and the launch of the Glancy Wine Education Fund! At San Francisco Wine School, we believe that every motivated and engaged student should have access to high quality, professional education in their trade. Since our inception in 2011, we have been providing tuition assistance and internship programs to worthy students interested in starting or advancing their career in the wine industry. The launch of the Glancy Wine Education Fund will allow us to greatly expand our ability to provide financial assistance to those in need. All event profits and auction proceeds will go towards establishing this important fund. Thank you for your support and participation! We’re excited to celebrate with you! Please do check out the list of seminars and classes the SF Wine School has to offer, it is quite extensive! And come on down to 415 Grand Avenue and get to know our neighbors! ANY wine that’s shared with friends! A robust red, like a Cabernet Sauvigon or Merlot. We are proud to announce the winner was Karen Johanson! However Karen was not able to attend tomorrow’s event so our next winner is HEIDI and she is excited to have won! Congratulations! My husband and I had a lovely time. The room is beautiful, with an amazing view out the tall windows. The wines were terrific, but the bites weren’t quite filling enough, so we walked down the street to Café Antigua after. A very enjoyable evening in South City! Thank you ESC!!! Thank you for circling back to let us know how the event was enjoyed. We are thrilled you had an enjoyable evening in our downtown.